Born in 1822, Frederick Goodall was the son of the eminent engraver Edward Goodall (1795 – 1870) who had engraved many of Turner’s works. He left school at 13 to work with his father, who taught him oil painting, and he attended life classes at St Martins Lane academy and a drawing school in Leicester Square. In 1836 he was commissioned to make water colour drawings of Willesden church and Lambeth Palace, which were exhibited at the Society of Arts. In 1838 he was awarded the Society’s silver medal for an oil painting Finding the Dead Body of a Miner by Torchlight which was based on sketches he had made drawing the construction of the first tunnel under the Thames. There he had met Brunel who encouraged him to go sketching in France and he began exhibiting at the Royal Academy, mainly scenes of rural life in England, Ireland and France. 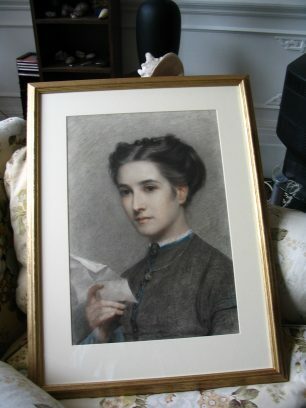 In 1846 he married artist Anne Thomson, daughter of engraver James Thomson and they lived at 4 Camden Square and had 5 children including F. Trevelyan Goodall and Howard Goodall (1850 – 1874). In the 1850s he painted genre scenes – for example Cranmer at Traitor’s Gate – and Gambart became his patron. 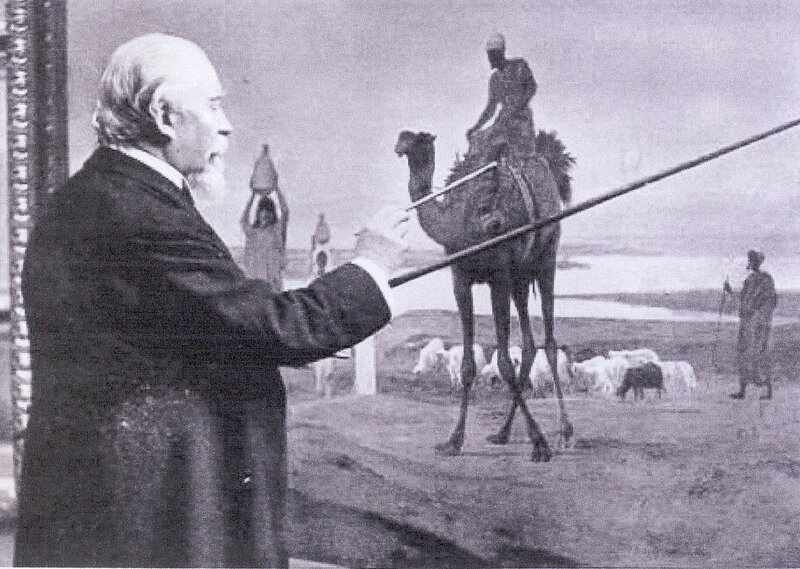 In 1858 he went to Egypt and painted Eastern subjects with biblical allusions, and by 1863 was elected to the Academy. His paintings gained popularity through engravings done by his father. 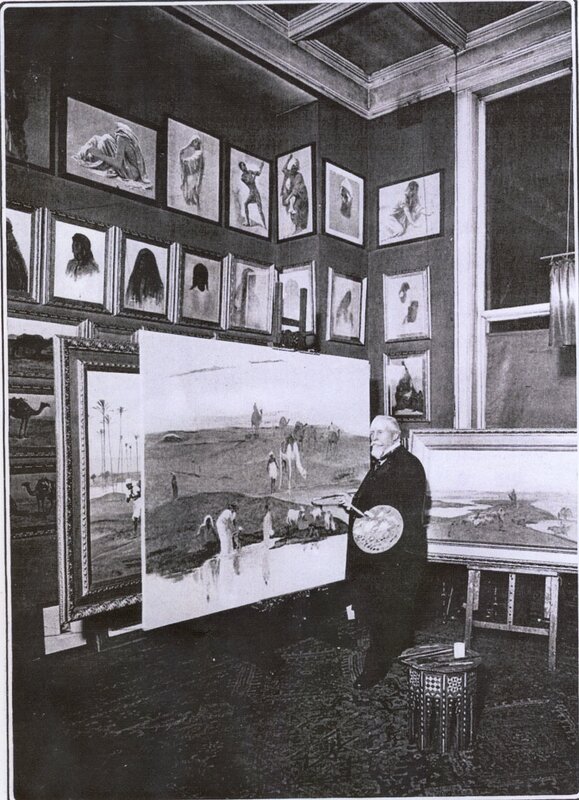 In 1869 50 of his Egyptian sketches were exhibited at the new Royal Academy in Burlington House and Gambart sold them all before the exhibition closed. But a time of sorrow was coming as his wife died the same year and tragedy struck his sons. Trevelyan had been educated at University College School and the Royal Academy School and won the silver medal there in 1866. 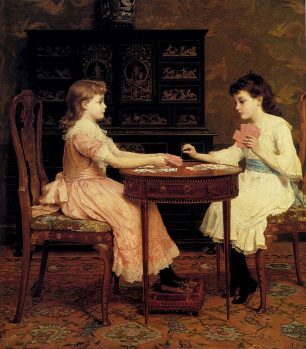 Between 1868 and 1871 he had 17 paintings exhibited at the Academy, and won the gold medal in 1869 for The Return of Ulysses as well as being commissioned to paint the portraits of Arthur Sparrow’s family. In 1871 Trev and Howard went to Pompeii and Capri, waiting for their father to arrive from Egypt. As the Times reported on 20 April 1871, the brothers who were affectionately attached, joined a party of friends in a visit to one of the most romantic spots of the island. 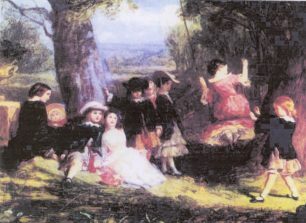 Both the young men were fond of pistol shooting and after a slight refreshment, Howard took out his pistol to show it to the party who were seated on the rocks, when, from some misunderstanding as to its state, it went off and the ball passed through the body of the brother, Mr Trevelyan Goodall. 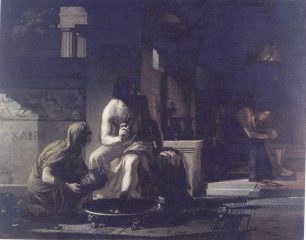 The details of the harrowing scene which followed, I omit; it is only necessary to say that the poor fellow, followed by his friends, was taken to his hotel, where the utmost kindness and sympathy were lavished upon him by his sorrowing countrymen, and the best surgical attendance that Naples could provide was sent for, but all in vain. On Tuesday morning some hope was entertained of his recovery, but inflammation setting in, he died late on Tuesday night. He is buried in the old Protestant cemetery, Naples. While dying Trev had expressed a wish that the Return of Ulysses should go to Arthur Sparrow’s daughter Edith , and when she died she left it to her nephew who finally donated it to the Art Gallery of New South Wales in Sydney. Trev’s friends established a memorial to him, the Trevelyan art scholarship at University College School , which is still awarded. Three years later in 1874, Howard died in Cairo. Meanwhile in 1872 Frederick remarried – to Alice Mary Tarry (1850 – 1913) who was also an artist who exhibited at the R.A. from 1890 – 96. By now Frederick was very prosperous, earning £10,000 p.a. He had bought land out at Harrow Weald in 1856 and commissioned Norman Shaw to design him a house there – Grimsdyke, with 30 acres of landscaped gardens. He imported sheep from Egypt so that he could paint them into his biblical pictures. But he felt too isolated there and it was eventually sold to W.S.Gilbert. 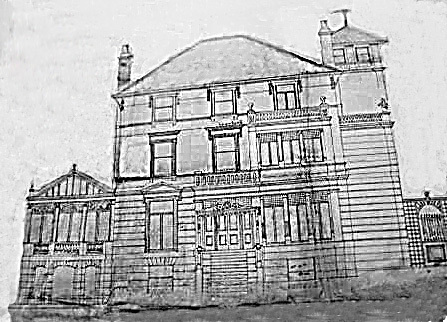 Goodall moved into Rosenstead, the art dealer Gambart’s house in Avenue Road. 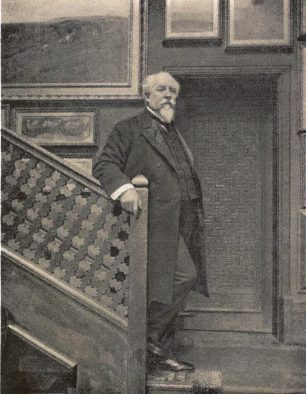 Gambart had added a very large room to the original house, which served as a picture gallery, concert room and ballroom (where Goodall had once seen Gounod brought in almost unconscious after the first night of Faust had been unsuccessful). In 1882 Goodall was granted a license to build a studio /conservatory, for he was devoted to his garden, often working there at five in the morning. His first and foremost recreation was gardening and the cultivation of flowers – in due time I became known amongst my brethren as the artist gardener. 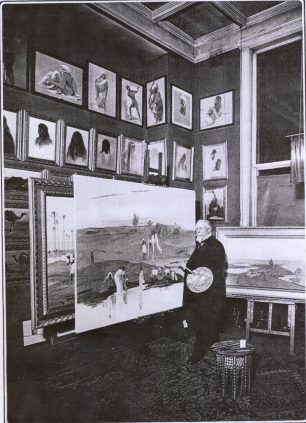 But his paintings were losing their popularity and his health was deteriorating and in 1902 he was declared bankrupt and his possessions were auctioned. 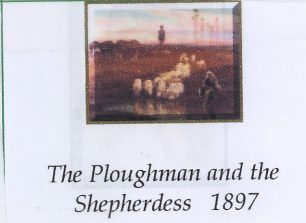 However, his friends collaborated in buying a painting of his, The Ploughman and the Shepherdess and giving it to the Tate Gallery. 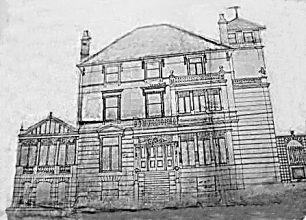 He moved to 36 Goldhurst Terrace and died on 28 July 1904.